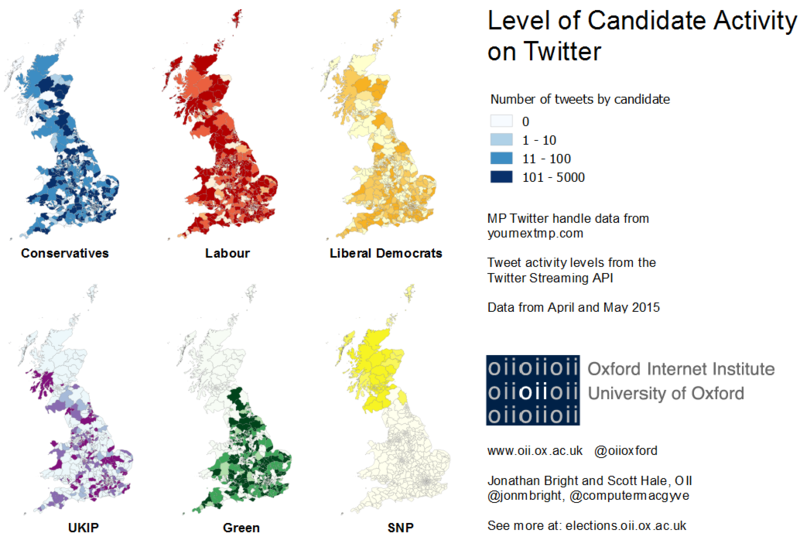 The (Local) General Election on Twitter | Can social data be used to predict elections? The UK’s national election is decided on a constituency basis: 650 odd separate small elections, each returning one MP. Despite the obvious importance of national parties and their leaders for shaping the election campaign as a whole, it is commonly accepted that the ability of local campaigns is also a significant factor. For example, the Liberal Democrats are well known for having highly organised local activities in their home constituencies; something which might help them hold onto seats despite their overall poor polling in national polls. Given this, for those interested in the influence of social media on the election, it’s worth looking not just at nationally relevant hashtags and Twitter accounts, but how local candidates have been using social media. Almost 450,000 tweets were sent by candidates of these six parties in the month leading up to the general election (the Labour party sent over 120,000, the Conservatives and the Green Party sent around 80,000 each, the Liberal Democrats just over 70,000, UKIP just over 60,000 and the SNP just over 15,000). 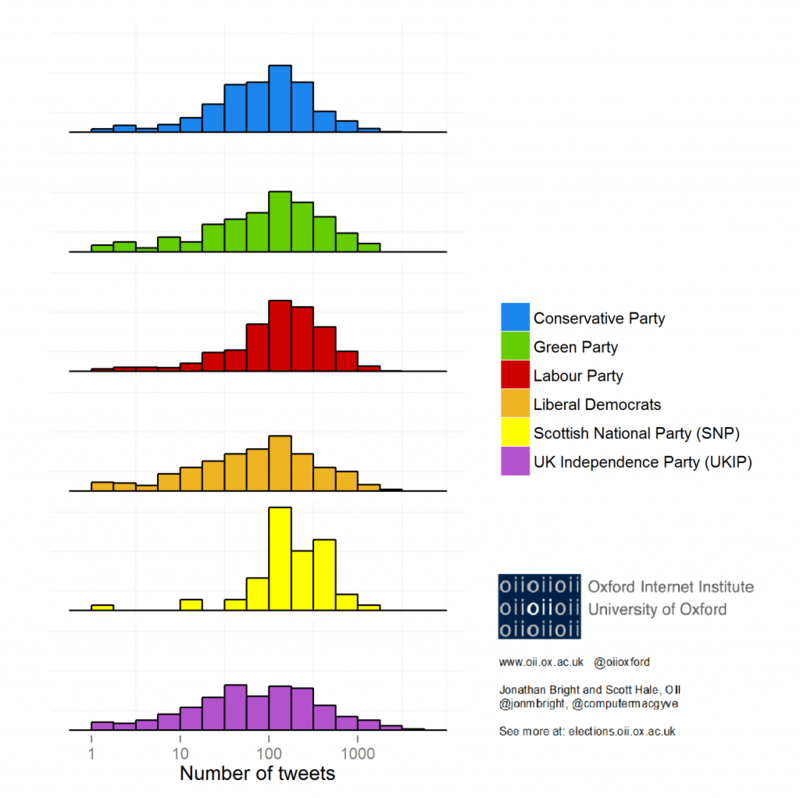 Compared to the map which Taha and Stefano produced on account distribution, in this new one regional patterns are clearly more apparent: whereas the major parties have candidates with Twitter accounts almost uniformly across the UK, their level of usage varies a lot. Only the SNP are uniform heavy users of Twitter: only two of their candidates sent less than 10 tweets in this period, and the majority sent more than 100. This also chimes with the fact that they are the party who has, relative to the overall number of candidates, created the most Twitter accounts – clearly they have a very active and organised social media presence. The histogram above show more detail about the level of twitter activity and how it breaks down between different parties. Conservative, Green and Labour have broadly similar patterns, with the average candidate having sent around 100 tweets in the last month, whilst a few have sent several thousand. UKIP and the Liberal Democrats show a flatter distribution. This entry was posted in Analysis, Data, GE2015, Twitter and tagged campaigns, data, ge2015, oii, oiige15, social media, twitter on May 12, 2015 by jonathanbright.